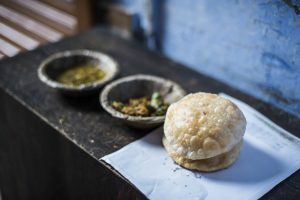 Whilst planning a ten-day trip that needed to end in Delhi and include a visit to the Taj Mahal, I came across the city of Lucknow. Exploring a map of India I spotted it neatly located between Varanasi and Agra and as such it seemed like the perfect stop-along-the-way. I had never heard of Lucknow and it’s fair to say the guidebook wasn’t too excited about it either. I mean no burning bodies nor world famous UNESCO site, why even bother, right? However it was exactly for these reasons that I loved Lucknow. My fellow travellers and I took the train from Varanasi and arrived (only five hours late) with no expectations and an open mind. My instinct was that this was going to be a great place and I wasn’t disappointed. We stayed at the Lucknow Homestay, which provided basic but perfectly adequate rooms and a really welcoming atmosphere. Dinner was offered for a little extra for which you sat with other guests to share a homemade meal and some fascinating conversation. Our fellow lodgers were both Americans studying in Lucknow where there is apparently a very good language school. They were deeply entrenched in the culture and I had my suspicions that one of them had gone a little of the rails as he walked around wrapped in a blanket and beanie hat, eating little more than porridge. However we got chatting and he seemed mostly sane. As our stay was only short we decided on a private organised heritage tour starting in the early morning, which we booked through the guesthouse. We were all blown away by this fantastic experience and highly recommend it. It’s not expensive, only R300 per person (currently equivalent to £3.75) and ran for about four hours. Atif our guide was softly spoken with a gentle stutter and clearly adored the history of his city. 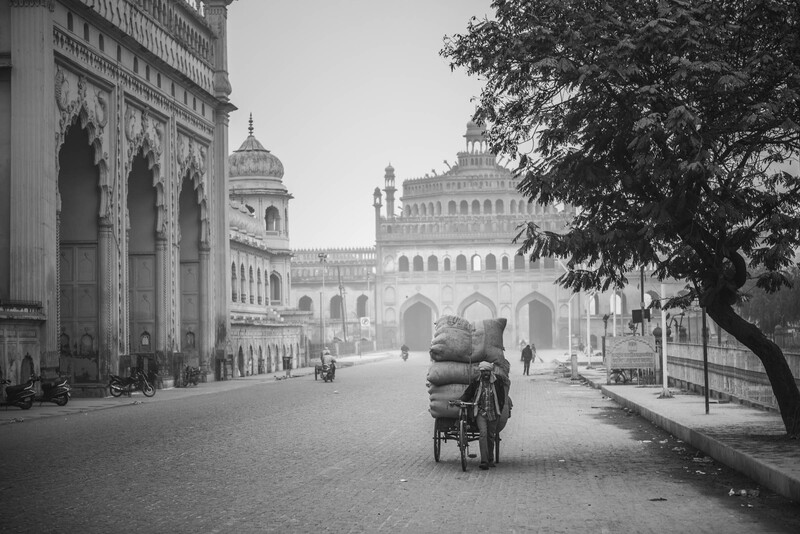 He walked us through interesting architecture, such as Bara Imambara and pointed out landmarks including the Hardinge Bridge, before taking us deep into Chowk, an ancient market where there were delicious local delicacies on offer. 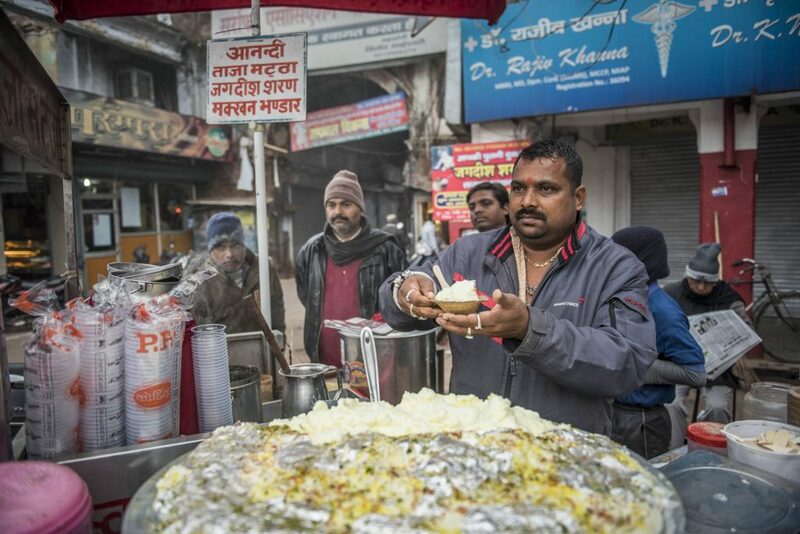 Makhan Malai only available in the winter months and limited to areas around Lucknow and Varanasi. Delicious breakfast curry – more sweet than spicy. We certainly wouldn’t have been brave enough to stop at some of the food vendors he pointed out had we gone alone, but with his guidance we tucked right in and experienced the winter sweet-treat Makhan Malai, a light cream dish topped with Chandi ka Warq (edible silver leaf, good for digestion),a breakfast curry, a sweet black carrot dish and of course a delicious chai. The area is famous too for its kebab, so later in the day, after getting a little lost, we enjoyed some incredible meat dishes at a very local restaurant. Lucknow is also laced with many crafts including Chikan, the hand embroidery that embellishes many of the fabrics and clothing you can find for sale, block printing, silver leaf making (hammered by hand for 4 hours to make it wafer thin) and art of herbal medicines consumed, we were informed, by the poorer Indian castes. 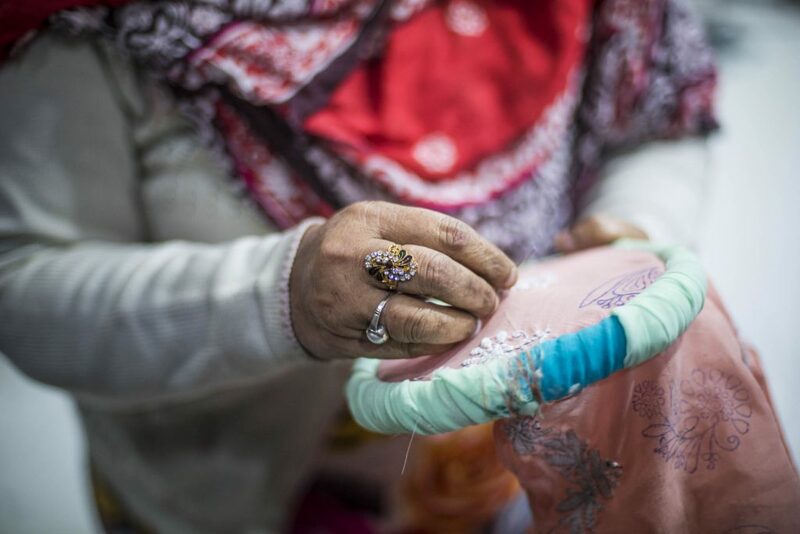 A lady beautifully embroidering fabric with the art of Chickan. As we turned down Phool Wali Gali, the sweet smell of roses and carnations replaced the somewhat human stench of the previous street and we walked past people making beautiful flower garlands for religious ceremonies. After tipping Atif with huge thanks and a quick selfie, (insert selfie) we waved goodbye and sailed off in a tuk tuk to The Residency, the former British establishment during the time of the Raj. The tranquil gardens represent the romanticised image of India found in old films and literature, and we enjoyed a lazy afternoon wandering the ruins and napping on the green lawns so uncharacteristic of the India we had seen thus far. 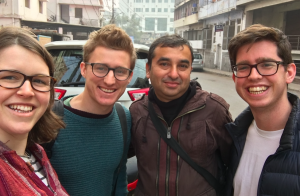 Me, Matt, Atif and Nick after a lovely morning spent exploring Lucknow. 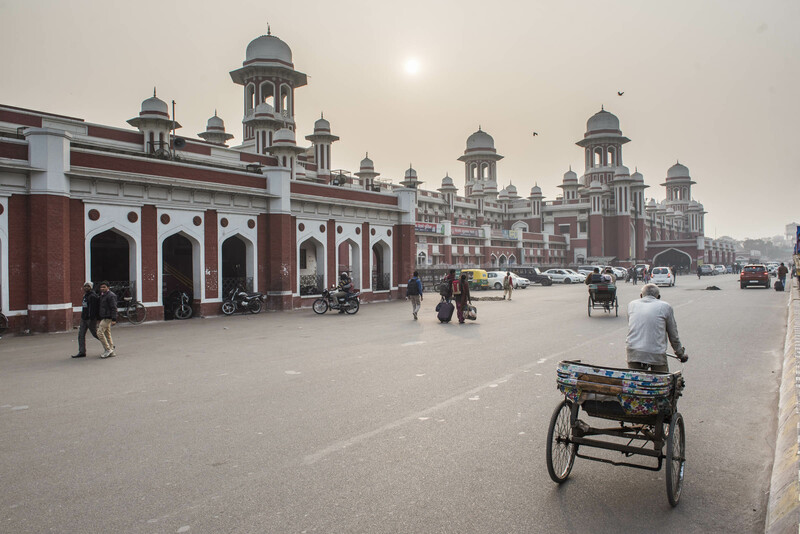 With time flying by and the Taj Mahal calling we bought train tickets to Agra – a confusing and time consuming experience involving many different ticket booths and a clear disregard for queuing – and set off on the next leg of our journey. If you want to know more, watch my video LUCKNOW – ADVENTURES IN INDIA. Thanks once again to Matthew Williams-Ellis for the beautiful photos.